The visibility level that you choose here will be applied to all newly created quotes in your account. Your users can still override this default setting on individual quotes. It is now possible to send invoices in ServiceTrade via email to the job's location and customer contacts. Previously you could send invoices via email, but only by manually typing in the recipient's email addresses, and then only for one recipient at a time. 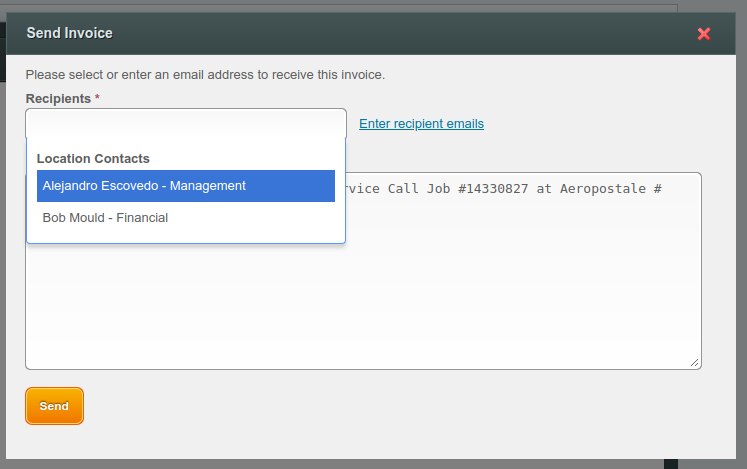 To send an invoice via email, Choose 'Send to Email' from the 'Send' menu on any invoice, then choose the contact(s) to whom you want to send the invoice from the Recipients dropdown list. If you need to enter an email address manually, simply click the 'Enter recipient emails' link and enter the recipient address into the text box that appears. Several new Sage Intacct integration features are included in this release. Sales Tax on Line Items - You can now specify whether you want the taxability of a given invoice line item to be determined by Intacct's sales tax rules, or by whether that item was flagged for sales tax in ServiceTrade. Customized Sales Order Transaction Definition - If your Sage Intacct integration creates sales orders, you can now choose a custom sales order transaction definition from Intacct, instead of being required to use the default 'Sales Order' transaction. More Configuration of Projects - If you use the Project dimension in your Sage Intacct integration, you can now associate the project's Class with the corresponding ServiceTrade job type, and you can now associate the project's Project Manager with the corresponding ServiceTrade job's owner. For more information about our Sage Intacct integration, please review this section of our support site. The technician tablet web application view now shows the estimated duration of each service. The new job page (currently available for beta testing) now supports editing the edges and rotation of your scanned paperwork files, and editing the due dates of existing services. Learn more about the new job page here. En Route notifications sent to customers by your technicians are now logged on in the job's History list. Appointments for jobs created by technicians in the tablet web application will now be automatically released to those technicians, even if your default account setting is to not release newly created appointments.